Bent Mahogany Base is held by a brass stretcher rod. Probber did have some famous dining chairs that also utilize the brass rod and curved slats but we all know there are tons of knock offs or just plain likeness designs out there, I just really wanted to see this in print. Earlier this year I won a beautiful little side table with a bent wood slatted x base. Not many turned up but the piece along with a similar magazine rack seem to get attributed to Harvey Probber. If you know me at all, you know I never believe others when they say ‘attributed to’ and prefer to do my own research. Over the summer I was able to review a Probber catalog at the Philadelphia Athenaeum Museum, which is basically an architectural museum and library. 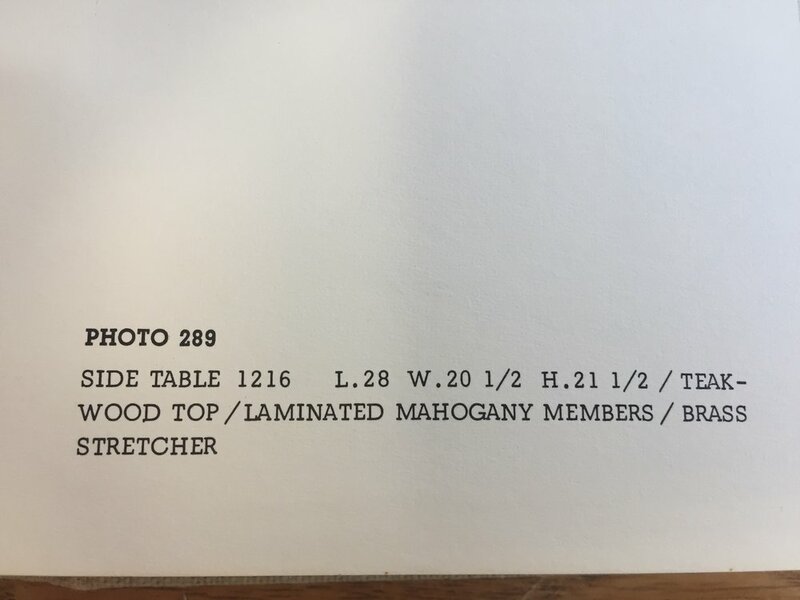 The small catalog was more of a brochure and did not contain the table. I did, however, discuss what I was looking for with the librarian who recommended I check both Winterthur and Hagley in Wilmington, DE. Both of these museums are in the realm of the DuPont family and document industrial history. I checked Hagley’s holdings and they had 2 Probber items I could review. Unlike most places I visit, they were able to pull them while I waited. ***RESEARCH TIP*** Most larger libraries have off site storage and it is very important you make an appointment in advance to review something specific in the collection. I am not an experienced Probber dealer so I could not determine much by the construction alone. It was obvious there was veneer used. The design was impressive and the use of the brass piece was definitely not your average look but I needed to learn more. Check out the catalogs are always a help. Sadly, there are really no resources online for Probber and his works that I found. I must say, after making the trip to Wilmington, I so enjoyed the perusal. So first I looked at The Kill Collection. It was a thin catalog that just featured pieces from this collection. Everything in this collection is metal. It is really lovely but not was I was looking for. The Librarian returned with the other catalog. This always makes me take a deep breath as I wonder if I will find my answer or go home with more questions after exhausting the 3 catalogs that are housed within 2 hours of me. When I took a look at the tabbed hard cover bound book, I was optimistic. Where to start? I turned to the Occassional section first. There were some side tables in the area but I did not find my table. My heart began to sink again. By this point, my goal was to get as much info out of this book as possible. There were wood chip samples of the finishes offered. I also realized that Probber sold directly to the trade. That means in order to buy his furniture, you needed to be working with an interior designer or architect. That cuts out a lot of middle America and also reminds me that these designer high end pieces will not be found easily. I flipped to the beginning and started to find small pieces again so my optimism returned. And finally, I found what I was looking for. I high fived the kids, who had reluctantly accompanied me on this trip, and sat for a bit taking it all in. Finish options. So cool that the sample chips were included! There were also plastic laminate chips of which only a white one was still intact. I believe my top to be plastic laminate. This particular piece and the magazine rack were not listed in the price list. Bummer. This book was a 1957 publication, by the way. So excited I was able to authenticate this piece! I hope I get to visit the Probber catalog again in the future! His designs were fabulous and I would call him more transitional than mcm purist. Unlike many of the lower end pieces, these are less kitschy and fun and all grace and elegance. Prior to my stop at Hagley, I visited a fabric outlet in Newark. It was worth the stop even though most fabrics were $20 or so a yard. I picked up 5 yards and feel like I know where I am going with that Knoll Antimott Chair now. I often hate to commit to fabrics and colors without a buyer but intelligent me knows most people don’t have enough imagination to choose. I wanted something colorful with a bold print. I have 3 yards of this (yellow/blue) I want to make the cushions out of. I also got 2 yards of another navy/turquoise/royal geometric weave. Both fabrics are indoor/outdoor and treated for fade resistance and sun protection but feel like a standard upholstery fabric. I think they will both do great in dining chair and high use applications. Stay tuned! If you are interested in purchasing the Knoll Antimott chair, there is still time to dictate the details. Reach out! I am half way through my income tax class and still very busy. Working on adding new listings in between homework. Please keep your eyes to my shops so you don’t miss anything! LOCAL? RENTALS FOR PHOTO SHOOTS! looking for the perfect accessory for photographing the kids? If I have a piece you’d love to borrow for a day or a few hours, let’s chat! I know I have some friends in photography and I would love to work out some rentals for your holiday shoots! Awesome petite church pew bench. Only 53”! Pinterest this and see how hot they area! In a dining nook, foyer or hall, mud room and so much more! Can work with primitive, eclectic and farmhouse looks too. This pew came out of a church in South Jersey years ago. The family is relocating to the west coast and leaving some things behind. Painted, chippy finish, antiqued.